The European Union (EU) Horizon 2020 Coordination and Support Action ESMERALDA aimed at developing guidance and a flexible methodology for Mapping and Assessment of Ecosystems and their Services (MAES) to support the EU member states in the implementation of the EU Biodiversity Strategy’s Target 2 Action 5. ESMERALDA’s key tasks included network creation, stakeholder engagement, enhancing ecosystem services mapping and assessment methods across various spatial scales and value domains, work in case studies and support of EU member states in MAES implementation. Thus ESMERALDA aimed at integrating various project outcomes around four major strands: i) Networking, ii) Policy, iii) Research and iv) Application. The objective was to provide guidance for integrated ecosystem service mapping and assessment that can be used for sustainable decision-making in policy, business, society, practice and science at EU, national and regional levels. This article presents the overall ESMERALDA approach of integrating the above-mentioned project components and outcomes and provides an overview of how the enhanced methods were applied and how they can be used to support MAES implementation in the EU member states. Experiences with implementing such a large pan-European Coordination and Support Action in the context of EU policy are discussed and recommendations for future actions are given. The ESMERALDA *1 (Enhancing ecosystem services mapping for policy and decision-making) project has assembled a team of leading researchers and practitioners from ecosystem services (ES) science and application in a Coordination and Support Action (CSA) funded for 42 months from 2015-2018 under the European Union's (EU) Horizon 2020 Research and Innovation Programme. This CSA has been dedicated to enhancing mapping and assessment of ecosystems and their services in Europe in the context of the European Union's (EU) Biodiversity Strategy *2 to 2020. The Biodiversity Strategy foresees in its Action 5 that all EU Member States shall: 1) Map and assess the state of ecosystems and their services in their national territories by 2014 ( European Commission 2011 ); 2) Assess the economic value of such services; and 3) Promote the integration of these values into accounting and reporting systems at EU and national level by 2020. The consortium represented a deep and shared commitment amongst all participants (researchers, decision-makers and various other stakeholders) from all 28 EU member states, Switzerland, Norway, Israel as well as the EU outermost regions, to contribute to the effective accomplishment of the challenges of the Biodiversity Strategy and to address the underpinning, cutting edge research issues in this important and timely topic area. Thus, appropriate methods, information and data are needed on where and how, for example, food, water, clean air, other materials and recreation are provided and how climate, nutrients, natural disasters, pests and diseases are regulated ( Bagstad et al. 2013, Harrison et al. 2018 Burkhard and Maes 2017 ). Information and data on actual ES demands, beneficiaries and potential mismatches with their supply location as well as ES quality and quantity, are mandatory for appropriate management of natural resources ( Bagstad et al. 2013 ). The protection of biodiversity, habitats and ecosystem functionality are keys for the sustainable supply of goods and services to human societies. Therefore, mapping and assessment of ecosystems and their services are core to the Biodiversity Strategy; they are essential if we are to take informed decisions ( European Commission 2011 ). Action 5 sets the requirement for an EU-wide knowledge-base, designed to be a primary resource for developing Europe’s green infrastructure. This is to identify areas for ecosystem restoration and to set a baseline against which the goal of 'no net loss of biodiversity and ES' can be evaluated. A dedicated working group on Mapping and Assessment of Ecosystems and their Services (MAES *3 ) has been established by the European Commission and meets twice per year in order to inform and update each other on progress and new developments within EU member states. ESMERALDA has been closely cooperating with the MAES Working Group and provided regular updates on its progress during the whole lifetime of the project. One finding of the MAES process was that ES mapping has already been taking place in the majority of the EU member states, but that it is not uniformly developed. Thus, EU-based guidance (e.g. via a common approach) was needed ( Maes et al. 2012 ). Assistance was also required in order to harness the broad range of ES mapping and assessment approaches currently available or under development ( Burkhard and Maes 2017 ). Transdisciplinary assessments have to integrate the state and functionality of ecosystems and their biodiversity as the basis for understanding the supply of ES, on the one hand and, on the other hand, for identifying the socio-economic system components and ES-related supply and demand patterns ( Burkhard et al. 2012 ). ESMERALDA has worked along four key project strands: (i) Networking, (ii) Policy, (iii) Research and (iv) Application in order to help ensure the delivery of all EU member states of Action 5. A ‘flexible MAES methodology’ was developed that can simultaneously provide innovative building blocks for pan-European, national and regional MAES studies as well as for local assessments required, for instance, for spatial planning, agriculture, land degradation, climate, water and nature policy. A key part of ESMERALDA was the mobilisation of relevant actors from science, policy, practice and society involved in ES science and application and to enable them to fulfil their commitments under Action 5. Fig. 1 provides an overview of the ESMERALDA strands and key objectives, which are all interlinked with each other. ESMERALDA strands and key objectives. In the following, an overview of the ESMERALDA Coordination and Support Action's implementation and its achievements will be given. 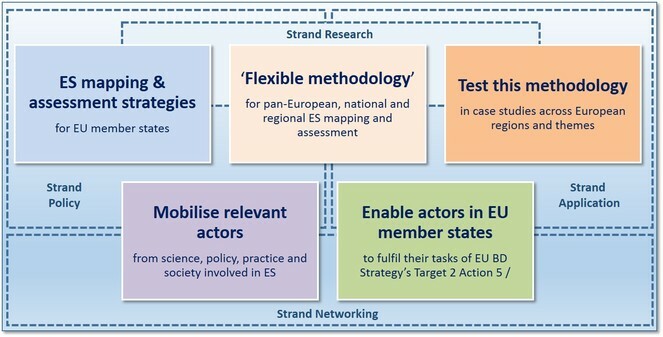 The work of ESMERALDA was organised along the four strands of Networking, Policy, Research and Application, which are described in more detail below. ESMERALDA started with identifying gaps and solutions for MAES implementation in the EU member states by intensive networking and stakeholder involvement, transmitting experiences through active processes of dialogue and co-creation of knowledge. The aim was to empower the participants and relevant stakeholders to achieve the aims of Action 5 by 2020. Based on relevant and completed or ongoing activities in Europe and worldwide (such as the EU MAES *3 Working Group, EU integrated projects such as OpenNESS *4 , OPERAs *5 , MESEU, BEST *6 and other related initiatives such as MA *7 or TEEB *8 ; see Maes et al. 2012 ) and national ecosystem studies (such as TEEB-DE *9 ; UK NEA *10 ; Spanish NEA *21 ), methods for mapping and assessing ecosystems and their services have been enhanced. ESMERALDA has been developing a flexible mapping approach that integrates biophysical, socio-cultural and economic valuation techniques. The methods were applied and tested in case studies across European biomes and regions ( Geneletti et al. 2018 ), including the EU Outermost Regions and Overseas Countries and Territories ( Sieber et al. 2018 ), on various spatial scales, including local ( Cortinovis and Geneletti 2018 , Steinhoff-Knopp and Burkhard 2018 , Nedkov et al. 2018 ), regional ( Bicking et al. 2018 , Balzan and Debono 2018 , Ruskule et al. 2018 ) and national ( Vačkář et al. 2018, Nedkov et al. 2018 , Lotan et al. 2018 ) scale case studies and addressed diverse themes from policy- and decision-making, businesses and citizens ( Maes et al. 2018 ). While the applications and testings took place, insights and results were already being integrated into European and global activities (see timeline in Fig. 2 ). Timeline showing the integration of ESMERALDA into related EU and global activities. The Strand Networking went on through the whole project duration as represented by the increasing number of participating EU member states over the project lifetime. At its start, the consortium consisted of 25 partners from 19 EU member states and Switzerland. At the end of the project, ESMERALDA included 37 partners from all 28 EU member states, Switzerland, Norway and Israel (see Fig. 3 and Suppl. material 1 ). This enlargement of ESMERALDA has enormously facilitated a pan-European assessment, testing, mapping and implementation phase towards the objectives of Action 5 of the EU Biodiversity Strategy. ESMERALDA consortium partner countries in Europe at the beginning and at the end of the project. Gaps in capacity and resources to carry out MAES in the country. Technical support (e.g. data use; guidance for mapping and assessment methods). A follow-up stocktaking in late 2017 revealed that many EU member states had made substantial progress in the implementation of MAES and that all EU member states were at least engaged in it. Capacity building in terms of knowledge sharing, ES mapping and assessment methods and data availability still seemed to be major gaps in many countries. The points from the initial and the follow-up stocktaking were taken up in the ESMERALDA workshops, which were a key element of the project. ESMERALDA workshops have taken place two to three times per year and in different EU member states across Europe. The workshops have successfully been linking the project consortium members with relevant stakeholders and specific topics of ES mapping and assessment in Europe. The workshops organised by ESMERALDA have considered different European regions and biomes, thematic questions from policy, businesses and citizens and were related to various case studies, as well as policy themes so as to increase the potential impact of the project on mainstreaming of ES in policy- and decision-making (see Suppl. material 2 for an overview of the ESMERALDA workshops). The organisation of the altogether ten workshops and the final project conference during the project lifetime has been logistically challenging and resource-intensive. The results of a strong network and an efficient results creation have, however, proved worth the efforts, because most of the outcomes could actually be directly achieved at the workshops. The interest from the policy-side in research and practice on ES mapping is high as ES are a very politically relevant topic. Ecosystem assessments usually start with a set of questions from policy, society, business or science ( Burkhard et al. 2018 ). ES mapping and assessment methods, selected to address these questions, need to be flexible enough to be applied in all EU member states (including outermost regions, marine areas and specific biomes) and related to various questions from policy, business and society in the context of the EU Biodiversity Strategy, as well as of the national Biodiversity Strategies, where present. Knowledge requests (e.g. Are Europe’s ecosystems healthy enough to continue supplying ES?). Technical and methodological guidance questions (e.g. What kind of methods can be used to include ES in policy impact evaluations?). Knowledge requests: are questions asking for a conceptual clarification, describing information needs, usually at the start of a policy cycle. The reports by the MAES working group (available for download from the MAES website *3 ) are essential sources of information to trigger and support ecosystem assessments in Europe. Policy support questions: are questions framing the use of ES as a concept to support a particular policy objective. These can include policies that have a positive or a negative impact on ES or are regulating the use of natural resources including agricultural policy, climate policy, biodiversity policy, spatial planning, impact assessment, disaster risk reduction and economic policy. Questions about resources and responsibilities relate to ES governance: these questions ask, what could organisationally be done or which kind of institutional setting is favourable to implement an ES-based approach. Questions about human capacities and financial resources needed to carry out ecosystem assessments (or to ensure that ecosystems and their services are integrated into decision-making) are important for consideration during the assessment. Application of ES mapping questions: are ‘how to’ questions focusing on the implementation of approaches and how to use ES mapping and assessment outputs to support policy implementation. Technical and methodological questions: are questions asking for specific technical details of ES mapping; commonly addressed issues are spatial scale, uncertainty, the appropriate use of certain methodologies, priority setting and preferences. The Strand Research of ESMERALDA has been clearly orientated on ES mapping and assessment methods and aimed at identifying, reviewing, enhancing, integrating and interlinking existing methods. The identified methods include biophysical, socio-cultural and economic ES quantification, valuation and mapping techniques ( Santos-Martin et al. 2018 ). Such methods are commonly applied to improve the understanding of ES supply and demand patterns over space and time ( Burkhard and Maes 2017 ). At the end of ESMERALDA, 49 groups of methods were identified, comprising 15 categories of biophysical, 22 of economic and 10 of socio-cultural methods. A multi-tiered approach for ES mapping and assessment was developed. The approach considers different methods (biophysical, socio-cultural and economic) at different levels of detail and complexity and can be applied according to specific needs, data and resources availability ( Weibel et al. 2018 ). To gain a comprehensive and systematic overview of existing methods, a methods database was created. This database contains information on existing ES mapping and assessment methods used by consortium partners in case studies and populated by a comprehensive pan-European literature review ( Santos-Martin et al. 2018 ). The database has been made publicly available by the creation of a user-friendly online interface, the ESMERALDA MAES Methods Explorer. Simultaneously, ESMERALDA provides guidance on how socio-cultural, biophysical and economic methods can be linked within ES assessments and on methods for integrating information outputs across disciplinary domains. At the end, ESMERALDA addressed the challenge of improving the applicability of these approaches with specific examples, particularly with respect to the MAES process and the ESMERALDA case studies ( Geneletti et al. 2018 ). ESMERALDA also provided important contributions to the update of the Common International Classification of Ecosystem Services (CICES *11 ) from Version v4.3 to v5.1. The work on CICES v5.1 was generally developed by a review of relevant scientific literature ( Czúcz et al. 2018 ), a survey conducted in 2016 and workshops held in 2016 as part of ESMERALDA and OpenNESS *4 ( Haines-Young and Potschin-Young 2018 ). Key inputs were also provided from the experience of using CICES within MAES. The new CICES version has been downloaded several hundreds of times already, indicating the huge interest in a common ES classification system. Another important component of the Strand Research was the development of an Integrated Ecosystem Assessment Framework. This framework is supporting the MAES process in EU member states by clearly setting out the role which spatial analysis (ES mapping) can play within ecosystem assessments in relation to non-spatial approaches (ES assessment); it also illustrates how and where, in a flexible way, integration can take place. An integrated assessment allows for transdisciplinary analyses of the interactions between different biophysical, socio-cultural and economic ecosystem, societal and policy elements. The results of the methods' review and the other components of the Research Strand contributed to the ESMERALDA Strand Application and to the development of the flexible ES mapping and assessment methodology. The variety of policy and planning processes that can be used to mainstream ES in real-life decisions, such as spatial and land use planning, water resource management, flooding under the EU Climate Adaptation Strategy, energy policy, strategic environmental assessment or protected area planning. The case studies and related ESMERALDA workshops across Europe proved to be an excellent means to test and further develop ES mapping and assessment methods and spatially available data, to engage local stakeholders (respective representatives from EU member states were invited to the workshops) and to implement MAES in the EU member states. More details of the research carried out in relation to the case study and methods testing work can be found in Geneletti et al. 2018 . Experience gained during the work in the four ESMERALDA Strands was used to establish a functioning stakeholder network (including stakeholder support groups in each country consisting of representatives from science, policy and practice), to improve ES mapping and assessment, to identify and improve related methods and to apply and test methods related to distinct questions from policy- and decision-making. One of the major outcomes of the project was the easy-to-access online open access interface ESMERALDA MAES Explorer *12 , which allows people to browse through the diverse end products. Amongst those products are project Deliverable reports, scientific open access publications, a text book on mapping ecosystem serivces ( Burkhard and Maes 2017 ), a glossary for ES mapping and assessment terminology ( Potschin-Young et al. 2018 ) and country and case study fact sheets illustrating MAES implementation and applications. Additionally, ES methods application cards focusing on the selection of appropriate methods for the mapping and assessment of one or more ES to answer underlying questions were provided. The ESMERALDA MAES Explorer also includes the ESMERALDA MAES Methods Explorer, allowing users to browse the ESMERALDA methods database and to collect further information on methods. The interface will help users of ESMERALDA products to find what they need for MAES implementation in their country, region, area or case study. Included guidance documents deliver detailed descriptions of MAES implementation in seven-steps. The guidance starts with relevant questions to be answered and the identification of stakeholders. It continues with network creation and the activation of the relevant stakeholders. The next steps are related to the ES mapping and assessment processes per se, their related methods, their application in case studies and further background information for ES mapping and assessment. An appropriate and user-orientated dissemination and communication of (often complex) scientific findings is key for successful implementation in decision-making – the last two steps of the ESMERALDA seven-step MAES/Action 5 implementation plan. Flexibility in ES mapping and assessment methods was achieved in ESMERALDA by analysing existing methods in a systematic review, testing them in various real-world case studies and by interlinking biophysical, socio-cultural and economic methods in transdisciplinary integrated ecosystem assessments. The design of a tiered mapping and assessment approach from simple (Tier 1) to complex (Tier 3) methods ( Weibel et al. 2018 ) is helping to harness the variety of methods. The approach is combining expert- and land cover-based approaches ( Burkhard et al. 2012, Campagne and Roche 2018 ) and the use of existing ES indicator data, with more complex and comprehensive ES modelling frameworks (see Burkhard and Maes 2017 ). Depending on data and resources available, the most suitable approach can then be chosen. Present clear real life examples and case studies including success stories of ES application. ESMERALDA has been promoting these processes by providing support in data and methods' selection and application as well as offering knowledge exchange opportunities for stakeholders during the numerous ESMERALDA topic-workshops across Europe (see Suppl. material 2 ). The strength of the ESMERALDA consortium has always been its capacity to provide solutions for ES mapping and assessment to relevant stakeholders from the start of the project. Furthermore, ESMERALDA was able to exchange information and knowledge with relevant networks and projects such as the MAES Working Group, the Ecosystem Services Partnership ESP *13 , IPBES *14 , OpenNESS, OPERAs and the OPPLA platform. Several project partners have been involved in multiple projects, enabling strong co-operation and creation of synergies. During the ESMERALDA project, numerous EU countries made substantial progress in the implementation of Action 5, as was monitored by the MAES barometer. This has been particularly evident for Ireland, Bulgaria (e.g. Nedkov et al. 2017 , METECOSMAP project *18 , TUNESinURB project *19 ), Romania, France, Germany ( Grunewald et al. 2017 ), Malta ( Balzan and Debono 2018 ), Greece (e.g. Dimopoulos et al. 2017 , Life IP 4 Natura Project *16 , lake Stymfalia ES project *17 ), the Baltic states ( Ruskule et al. 2018 ) and Poland. ESMERALDA has been successful in mobilising and increasing scientific capacity in these countries (e.g. Kokkoris et al. 2018 ). It has enabled reseachers and policy-makers to extend their national networks to regional and European scales. In turn, there is evidence that this has increased the capacity of those countries to lead and coordinate their research on ecosystems and their services at regional levels. ESMERALDA supported the creation of new European collaborations and the establishment of new national e.g. Poland, Greece ( Dimopoulos et al. 2017 ) and regional (e.g. South-eastern Europe) ESP chapters and networks. Furthermore, new cooperations and projects with the EU outermost regions and overseas countries and territories could be established. The first ESMERALDA spin-off EU project MOVE *20 (Facilitating MAES to support regional policy in Overseas Europe: mobilising stakeholders and pooling resources) started in April 2018. 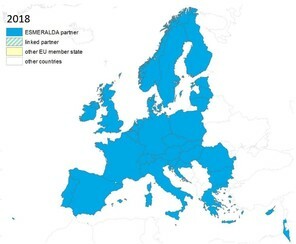 Several ESMERALDA partners are involved in the new CSA project MAIA (Mapping and Assessment for Integrated ecosystem Accounting), replying to the Call on “Valuing nature: developing and implementing natural capital and ecosystem accounts in EU Member States and Associated Countries”, which marks the next step in the MAES process. MAIA will start in autumn 2018 and can build directly on ESMERALDA outcomes. These initiatives help, with support of the European Commission, the ESP, common ES-related platforms such as OPPLA and BISE and the EU member states, to maintain ESMERALDA products after the project finishes and to make them available for future activities. The large pan-European ESMERALDA consortium created an extensive and detailed cross-disciplinary knowledge based on ES mapping and assessment, its application in the context of MAES in EU countries and has completed a comprehensive European case study and methods review. The case studies proved to be a very constructive and successful way to engage stakeholders from the member states, to test methods and to deliver relevant outcomes. Contacts with relevant projects, initiatives, knowledge-bases and stakeholders across Europe have been mandatory to achieve the ESMERALDA objectives. The regular ESMERALDA workshops in different European regions were used to bring together scientists and stakeholders from EU member states in order to discuss and develop knowledge, methods and cooperation. The integration of stakeholders into project activities, especially in the case studies, the regular project workshops and the project mid-term and final conferences were one key to the success of ESMERALDA. Workshops and face-to-face meetings proved to be an excellent means for creating and maintaining a strong and functioning network. Intensive knowledge exchange and capacity building were able to occur during the ESMERALDA workshops. However, the organisation of all thematic workshops, the mid-term and the final project conferences have been logistically challenging and resource-intensive. Therefore, various project partners were selected as hosts for the workshops. Nevertheless, the workload on the ESMERALDA Executive Board (EB) members and work package leaders has been comparatively high, considering alone the 27 EB meetings until the final project conference in June 2018 was reached. Based on the available funding for CSAs and the large size of the consortium with, in the end, 37 partners, the budget available for personal costs has, in most cases, not been in accordance with the workload. ESMERALDA could harness its pan-European network and build on existing ES case studies provided by the consortium partners. Against this background, ESMERALDA, as a CSA, profited substantially from contributions made by the project partners and their institutions/existing networks to the Action which have not directly been financed by the project. The same goes for the eleven new ESMERALDA project partners who entered the project in this phase and who were willing to contribute to ESMERALDA, based on provided travel budget only. This dedication to an Action is exceptional and proves the strong interest of EU member state representatives in ESMERALDA. This can, however, not be taken for granted for all activities related to the implementation of the Biodiversity Strategy and the Horizon 2020 funding programme should be adapted in order to provide sufficient resources for pending tasks. 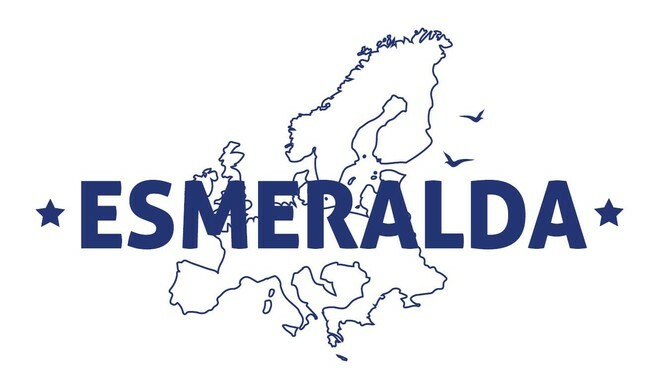 ESMERALDA Logo, bringing together Europe in a generalised map. Maintain the enthusiasm by bringing people together including post-project – have fun! 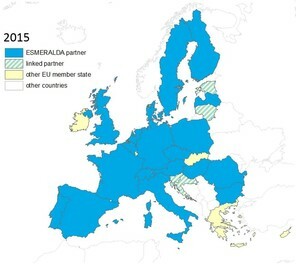 We want to thank all ESMERALDA consortium and cooperation partners, stakeholders and other active people contributing so ambitiously to the success of ESMERALDA and the great progress that has already been made in the implementation of Action 5 in all 28 EU member states, Switzerland, Norway and Israel. May ESMERALDA live long and prosper! The ESMERALDA project received funding from the European Union’s Horizon 2020 research and innovation programme. ESMERALDA: "Enhancing ecoSysteM sERvices mApping for poLicy and Decision mAking", grant agreement No 642007. Authors: Benjamin Burkhard et al.